Dark Star is the third offering from fledgling SFF publisher Unsung Stories. Their remit is to publish ‘fiction that defies categorisation. We want to tell stories that you’ll never forget.’ The first question that needs to be answered then, did they deliver? ‘The city of Vox survives in darkness, under a sun that burns without light. In Vox’s permanent night, light bulbs are precious, the rich live in radiance and three Hearts beat light into the city. Aquila. Corvus. Cancer. Hearts that bring power to the light-deprived citizens of the city of Vox whilst ghosts haunt the streets, clawing at headlights. Prometheus, liquid light, is the drug of choice. The body of young Vivian North, her blood shining brightly with unnatural light, has no place on the streets. So there’s no sun. Well, there’s a star, but it’s gone dark. Those who have read it might be reminded of Jasper Fforde’s incredible world in Shades of Grey, only here we have a world without natural light rather than colour. One interesting similarity is the resulting reliance on, and therefore value placed on, the artificial. It has the effect of singling out main characters as the sane few who see through to reality. Virgil’s reality however, is one he continually seeks to escape. Constantly haunted by a previous case in which he made his name, and from which he received a hanging scar round his neck, he habitually injects himself with Prometheus, Vox’s appropriately named drug of choice. His partner Dante, straight-laced by comparison, drags Virgil out of his funk long enough to investigate the body of Vivian North, whose veins are ablaze with a light not of this dark world. Could her death be drug related? A most unusual murder? Before having time to really investigate, Virgil is brought in to investigate the disappearance of one of the three Hearts which illuminate Vox. He knows he’s a washed-up junkie, so why is he on such a crucial case? This question which he asks himself is central to Virgil’s conflicted character. Since it also drives the plot, we learn about the two side by side. In case I’m not making it clear, I’ll say it outright: the structure and pacing of this story are fantastic. As with all the greatest tales, it seems to have a life of its own, with the characters driving the story, and the story driving the characters in equal measure. The story’s internal tension is again mirrored by Virgil’s struggle to trust his usually reliable, now drug-addled, instincts. 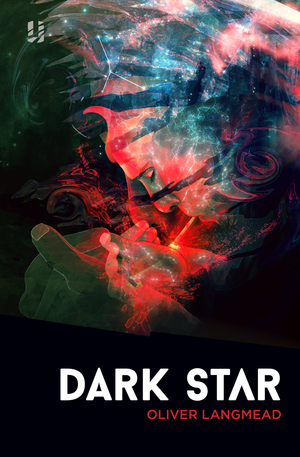 On top of great character exploration, an originally imagined world and an intoxicating and intense mood, Dark Star gives you a beautifully planned conspiracy, a trip to a vast spaceship and an ending that doesn’t disappoint. Better than simply unique, Oliver Langmead’s debut is brilliant.